There are many people in South Sudan who think that picking up a gun is and was the only way to liberate the oppressed African Person in the Sudan. There are many people who contributed to the liberation of an oppressed people through non-military means. And these non-military means include the use of facts and truth in the face of the distortion of the truth by power politics or ‘game of power’ as Robert Greene would say. This distortion is now crippling South Sudan as an independent state. Prominent names (a sample) in the then Southern Sudan, who used nonmilitary means to stand up for the rights of the people of Southern Sudan include Stanislaus Paysama, Both Diu, Hilary Logali, Mading de Garang, Ezboni Mondiri, Clement Mboro, Abel Alier… (this list is long). What is sad is not only the fact that those who didn’t join the SPLA war, even if they have contributed enormously, were considered traitors; what is sad is that some of those who used the power of their words in defense of every person in South Sudan now support the very same state machinery that they fervently fought against. SPLA, in their propagandistic modus operandus, considered those who didn’t join the SPLA war as bourgeoisified jobbists. In 1965, following the resignation of the frustrated Sirr Al-Khalifa El-Khatim, who replaced Ibrahim Abboud military dictatorship, and his replacement by Mohammed Ahmed Mahjoub in June, the reign of terror against Southerners began in earnest. The failure of the proposed constitutional arrangement that was supposed to solve the ‘Southern problem’ brought about the end of the then promising El-Khatim’s short reign. But El-Khatim’s successor, Mahjoub, instead of respecting the recommendation of the 12-men committee that was formed following the Round-Table Conference, decided to resume Abboud’s heavy-handedness and genocidal activities in the South. This heavy-handedness led to the infamous massacres of civilians and other members of the Southern intelligentsia all over Southern Sudan. Many were forced into exile in Ethiopia, Congo, Uganda and Kenya. Some aggrieved Southerners joined the Anyanya rebellion, just formed two years earlier in 1963. 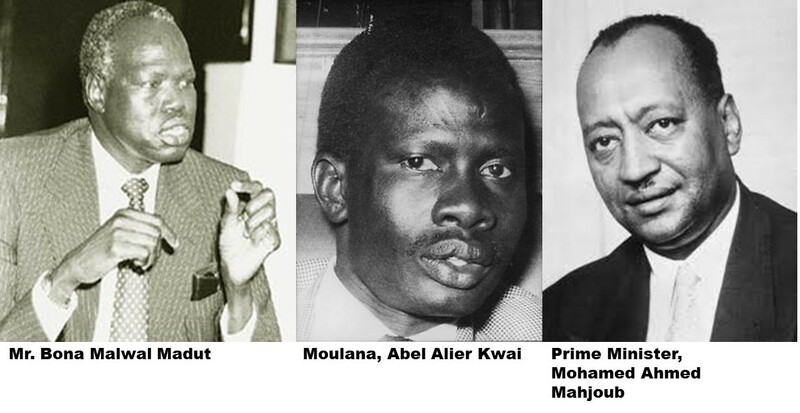 Of the memorable events of Mahjoub’s reign of terror are the mass massacres of civilians in Juba and Wau, the report of the massacres by The Vigilant, then an English-language publication by Southern Front, one of the Southern political parties formed in 1965, and the government’s court case against The Vigilant. The Vigilant, edited by Bona Malwual Madut and Darius Beshir, reported that the government of Mahjoub was undertaking an ethnic cleansing agenda to depopulate the South of its African racial stock. The editors also reported that the number that was reported by the government official sources underreported the number of the dead in both Juba and Wau. Official sources put the number in Juba at about 360. The Vigilant put the number in Juba at over 1400. This report prompted the government to shut down the newspaper, ordered the arrest of the editors and charged them with treason and incitement. The edition of the newspaper that instigated the closure and indictment, brought the problem in the South, by then ignored by the world and regarded only as an internal problem as Khartoum wanted the world to see the Anyanya war, to the world attention. Foreign newspapers both in Africa and outside Africa, started to cover the suffering of the African Person in the Sudan. A prominent Southern lawyer, Abel Alier, took over the case and defended the editors in 1965. Alier brought both Southerners and Northerners as witnesses to testify about the facts of the case and the truth of the army persecution of Southerners. The witnesses confirmed what The Vigilant reported. In a rare show of adherence to facts, not politics—something that is almost impossible now in South Sudan—the judge ruled in favor of The Vigilant. Without Abel Alier, those of Darius Beshir, Bona Malwal, and Chan Malual, would have been charged with treason and possibly put to death. He used facts and his legal platform to stand up to the rights of not only the editors of The Vigilant but what they said regarding the suffering of the people in the South. Alier put his legal profession and even his own safety at risk to defend the rights of Southerners. I narrated this brief historical overview to remind South Sudanese to look back at their historical struggle in order to forge a clear and inclusive way forward. What is bizarre about the case of The Vigilant is that one of the opinion pieces that instigated the case against the newspaper was written by a then young lawyer, Ambrose Riiny Thiik, a current member of the infamous Jieeng Council of Elders. Both Ambrose and Bona Malwal, now considered infamous in the tribalized politics in South Sudan, by then stood for the rights of South Sudanese regardless of tribe. They were using mere words. They are now part of what is tearing South Sudanese apart. However, Alier defended what they said in support of the Southern cause; a cause that would lead to the secession of the South 46 years later. While Alier remained faithful to his ideals about the liberation of the Southerners even if he didn’t pick up a gun in support of the Southern cause, Bona and Ambrose have been courted by the lure of power politics in Juba. They have turned their backs against the very people they defended in 1965 even at the risk of getting hanged. My advice is for us to revisit history in search of what united us and to pay attention to those who contributed to the Southern liberation in a non-military means. This would help us appreciate the role of critics against Juba now. You can’t appreciate truth or falsehood about yourself unless you look critically at what your critics say about you and your performance. Kuir ë Garang is the author of several books including South Sudan Ideologically, Is 'Black' Really Beautiful? and The Dying Optimist in Me.